Dealsrus is well known for offering quality artwork at reasonable prices. Our reputation is stellar and we stand behind everything we sell. 20th Century Pennsylvania Dutch Folk Artist best known for her Naive style Amish and farm scene paintings. Original signed oil painting on canvas. Canvas: 8″x 10″ Frame: 11.5″x 13.5″. 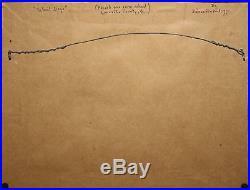 Signed lower right–see photos. Looks excellent, in original “as found” untouched condition, no visible wear, fading, or damage–please look at photos carefully. Fantastic oil painting by Dolores Hackenberger, a beloved Pennsylvania Dutch Folk Artist. 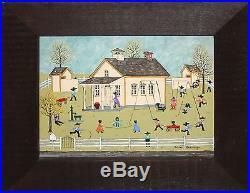 This painting depicts a darling scene of Amish children playing in front of a one room school house. Hackenberger is best known for her Lancaster Amish subject paintings. This is a fine example of her work in great condition. Lovingly referred to as the “Grandma Moses of the Pennsylvania Dutch country, ” Dolores has painted the colorful Amish folk and culture for the past forty plus years. Her distinctive folk art style vividly depicts the simple and charming traditions of the Amish neighbors, with whom she has worked and visited throughout her life in southeastern Pennsylvania, graced by wooden frames lovingly made by her son. Self-taught, Dolores began receiving recognition early, winning in the Chicago National Art Show near the beginning of her career. Since that time, she has earned international acclaim. Her paintings have won numerous top awards in juried competitions judged by authorities such as Eric Sloan, John McCoy and Warren Rohrer. Exhibitions of her work have been conducted in many institutions throughout the nation including, the Philadelphia Museum of Art, the Reading Public Museum, the Chicago National Art show, Franklin & Marshall College, and Lebanon Valley College. Her paintings are also in Australia, New Zealand, Japan, and other areas throughout the world. Most recently, her paintings have been viewed in the. Better Homes & Gardens’ Country Home. She is honored to be one of the chosen artists in the limited-edition history book. Her work has been collected by such prominent figures as President George Bush, the later Senator John Heinz, Congressman Robert Walker, Celeste Homes, Rod Stewart, Paul Newman, Oliver North and many other private collections. I paint seven days a week, anywhere from two to ten hours a day. I’m constantly amazed. I’ve never gotten over the thrill of people wanting to own my work. Dolores has won or received awards in 20 of 25 competitive shows which she entered from 1960 onwards. She loves antiques, which her paintings reflect. 100% Guaranteed to be as described. Ask all questions beforehand. All Sales are Final. All sales are final. We ask for your patience and assure you we are acting as quickly as we can. All lots are accompanied by a name and/or description and lot number for reference. An approximation can be provided beforehand if requested. Thank you for your cooperation in the matter. All lots are guaranteed to be as described. Prospective buyers are responsible for asking any and all questions about the merchandise, and to view all photos carefully, before purchasing. We try to depict the merchandise and artwork as accurately as possible with photographs. We do not overly enhance the photos. However, every computer and monitor is different, and how we see the merchandise might differ from what you see. Please bear this in mind when viewing. Contact before purchasing for any questions you have. Unless otherwise specified, frames are considered a throw-in and are not guaranteed in any fashion. Sizes listed in the descriptions are a very close approximation, ie. If the painting is 12.2 x 14.2 we would describe such as a 12 x 14. 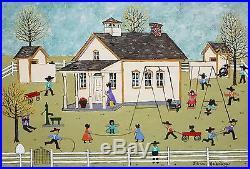 The item “DOLORES HACKENBERGER-PA Dutch Folk Artist-Original Signed Oil-Amish School House” is in sale since Monday, July 24, 2017. This item is in the category “Art\Paintings”. The seller is “dealsrus” and is located in Pottstown, Pennsylvania. This item can be shipped worldwide. This entry was posted in dolores and tagged artist-original, dolores, dutch, folk, hackenberger-pa, house, oil-amish, school, signed. Bookmark the permalink.